Laurie McDonald Jonsson is an active global leader with 25+ years of business leadership experience in travel, real estate and entrepreneurial ventures. Laurie is principal and board member of Stellar Holdings, an international real estate development company and president & founder of Stellar International and Stellar International Networks. Laurie has helped build and manage businesses in the travel industry, cruise ship and real estate business, including co-founding Sundance Cruises and Admiral Cruises and Stellar Travel. She was one of the first women owners of a cruise ship business with ship sailing’s to Alaska, Mexico and the Caribbean. Laurie is currently on the board of directors of Stellar Holdings; Bygg Vesta, Stellar Polska, Gron Bostad which are global real estate companies. 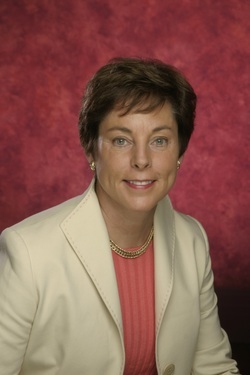 She was a founding director of Expedia.com, Commerce Bank and Puget Sound Bank. Laurie is president and founder of Stellar International Networks—a company whose mission is to link women leaders of the world to create new approaches and concrete actions on a range of issues. In 2011, Stellar International Networks and USC Marshall Business School partnered in leading a powerful group of experienced and emerging women leaders for a multigenerational and cross-cultural leadership and learning experience in Beijing, Lijiang, Shanghai and Hangzhou, China. In 2006 and 2008 Stellar International Networks successfully organized women leadership delegations to China with Senator Maria Cantwell. In addition to China, Laurie has organized and led delegations with Senators Patty Murray and Cantwell to Cuba, Sweden, Poland, the Czech Republic, Hungary, Lithuania, Latvia, Estonia and South Africa. Laurie is a member of USC Marshall School of Business Board of Leaders; the Committee of 200 (C200), International Women’s Forum and Harvard University JFK School of Government – Women’s Leadership Board. She is on the Advisory Council of the Women’s Presidents Organization. She was appointed chair of the Governor’s Executive Women’s Council by China Ambassador Gary Locke; is founding chair of the Center for Women and Democracy at University of Washington and received a United States presidential appointment to the National Women’s Business Council. She is the founding president of the Washington State chapter of the International Women’s Forum. She was awarded “Leading Women Entrepreneur of the World” in Monaco and International Women’s Forum “Women Who Make A Difference” award. Laurie is married to Lars Jonsson and their children Jonas, Marcus and Jenny are University of Southern California Trojans.